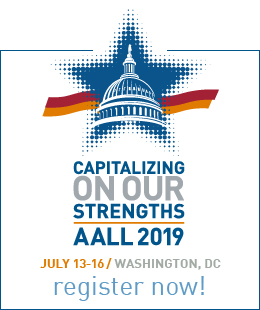 Registration is $795 for AALL members; $1200 for nonmembers. Registration is first-come, first-serve, and limited to 50 people. Participants are responsible for covering transportation and housing (see Accommodations below). Materials, continental breakfast, break, and lunch each day are included. Payments will be accepted via check or credit card and are due in full by April 8, 2019. You may cancel your program registration in writing by April 8, 2019, via email to prof-edu@aall.org. You will be refunded your registration fee minus a 15% administrative charge. Any cancellation requests received after the deadline will not be eligible for a refund. No-shows will not be eligible for a refund. Substitutions are welcome as long as the written request is made by the registration deadline. Thursday: 1:00 p.m. to 5:00 p.m.
By attending the conference, you agree that AALL, its employees, contractors, and volunteers, may photograph, videotape or audiotape you during the conference and related activities. Your photo, video, audio, likeness, or image may be used by AALL for promotional or related purposes with no remuneration to you. 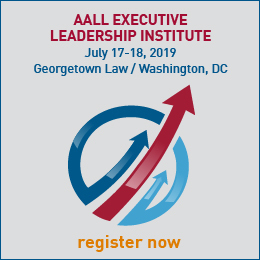 Attendees are expected to follow the rules outlined in AALL’s Meetings and Events Code of Conduct. AALL has negotiated a block of hotel rooms at the Union League Club at a discounted rate of $169 single/double per night. Rates are subject to a 20% tax. This hotel block of rooms ensures easy access to the meeting location and networking opportunities. To make a reservation, contact the Union League Club reservations number at 312.427.7800 or contact clubservices@ulcc.org and reference AALL Innovation Bootcamp. The deadline for making your housing reservation is Monday, March 25, 2019 (11:59 p.m. CDT). Room reservations made after this date will be subject to availability. Rates will be available for participants two (2) days prior to and after the program. A credit card will be required to hold your reservation. In the event an attendee must cancel, he or she must do so by contacting the hotel by 3:00 p.m. the day prior to arrival to avoid penalty of one night’s room cost. No-shows will also be charged for the cost of one night’s room. Check-in time is 3:00 p.m.; checkout time is 12:00 p.m.